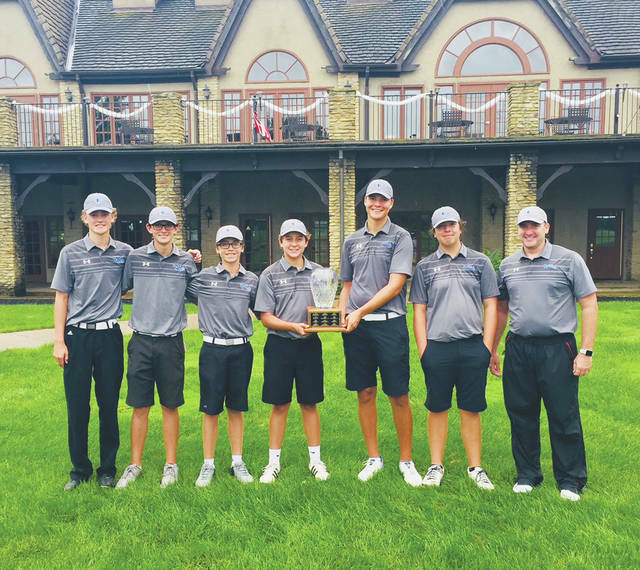 Members of the Olentangy Liberty boys golf team stand with their trophy after winning Monday’s Delaware Cup at Royal American. Conditions weren’t ideal — rain and a tricky course made sure of that — but the result was still the same as it’s been each of the past five seasons after the final scores were added up at Monday’s Delaware Cup at Royal American. Olentangy Liberty’s boys golf team, for the sixth season in a row, took top honors. As for the rain, while less than ideal, teams were able to find a silver lining. Drew Blosser and Jack O’Donnell led Liberty with 78s while Logan McCarrell and Josh Steyer had 79s. Olentangy Orange and Olentangy Berlin rounded out the top three with respective efforts of 321 and 324. Jon Green led the Pioneers with a 76 while Brendan Cabungcal had an 80, Nathan Brown finished with an 81 and Corbin Bentley and Alex Cabungcal carded 84s. Bryce Reed boosted the Bears, leading his team and the entire field with a 72. Other Berlin scorers included Leila Raines (81), Tanner Shimp (85) and Ethan Hegg (86). Delaware Hayes and Olentangy finished tied four fourth, closing with team scores of 329, while Big Walnut smoothed out the scoring summary with a 343. Pacer scorers included Luke Gazarek (76), Mark Sulek (84), Jake Ross (84) and Ben Madden (85). The Braves, meanwhile, got scores from Ben Nash (81), Cam Casto (82), Bennett Zeitner (82) and Tyler Phillips (84) while the Golden Eagles counted the efforts of Kyle Williams (85), Kenny Schneider (85), Zack Herbert (86) and Austen Bennett (87).